For the planned but never-produced TV series, see Star Trek: Phase II. 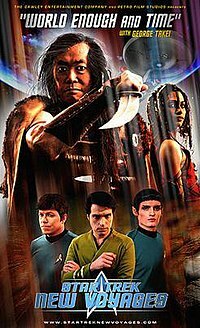 Star Trek: New Voyages, known from 2008 until 2015 as Star Trek: Phase II, was a fan-created science fiction webseries set in the fictional Star Trek universe. The series was designed as a continuation of the original Star Trek (aka ST:TOS or just TOS), beginning in the fifth and final year of the starship Enterprise's "five-year mission." The first episode was released in January 2004, with new episodes being released at a rate of about one per year. Production on new episodes quietly halted in June 2016 following the release of new fan film guidelines by CBS/Paramount in response to the Star Trek: Axanar controversy, with three episodes in post-production left unreleased. The sets constructed for New Voyages were licensed as a 'Studio Set Tour' beginning in July 2016. The series is notable for its longevity, being the first such show with extensive standing sets, and that it has attracted the talents of a number of professional writers and actors associated with official Star Trek productions, including George Takei reprising his role as Sulu in "World Enough and Time", and Walter Koenig as Chekov in "To Serve All My Days". Eugene Roddenberry Jr., the son of Star Trek creator Gene Roddenberry, served as consulting producer. The show's best-known episode "World Enough and Time" was nominated for the Hugo Award for Best Dramatic Presentation, Short Form in 2008, alongside episodes of Doctor Who, Torchwood and Battlestar Galactica, but lost to the Doctor Who episode "Blink." For a five-episode run beginning with "Blood and Fire" in December 2008 and ending with "Kitumba" in December 2013 the series title was changed to Star Trek: Phase II before reverting to New Voyages. New Voyages creator James Cawley himself portrayed Captain Kirk in the first nine episodes before turning the role over to Brian Gross, choosing to assume a more behind-the-scenes role. Between January 2004 and May 2016 some 11 full-length episodes and a number of short-form "vignettes" were released (see linked article). Three episodes were scripted by professional Star Trek writers: "To Serve All My Days" by Dorothy Fontana; "World Enough and Time" by Marc Scott Zicree; and the two-part "Blood and Fire" by David Gerrold. Two other episodes were based on unfilmed stories for the unproduced 1978 Star Trek Phase II TV series: "The Child" and "Kitumba", neither with the permission of Star Trek rights-holders. Additionally, the episode "Mind-Sifter" was based on a well-known piece of fan fiction from the 1970s. As of May 2016 several additional episodes were in various stages of pre- or post-production. The recurring actors on New Voyages are mostly unknowns who were brought to the project because of their love of Star Trek. In the table below the parenthetical numbers indicate in which episodes actors appeared in given roles. Episode "0" is the pilot film "Come What May". Brian Gross (9–10) Captain Captain and commanding officer of the starship Enterprise. Brandon Stacy (6–10) Commander A human/Vulcan hybrid. Science and First Officer. One of Captain Kirk's closest friends. Jeff Bond (9) Lt. Commander Chief Medical Officer and one of the captain's closest friends. Charles Root (1–10) Commander Chief Engineer and third-in-command. Best known as "Scotty." Jasmine Pierce (9–10) Lieutenant Communications officer and sole female commissioned officer in the regular cast. Shyaporn Theerakulstit (9–10) Lt. Commander Helmsman. First appeared in the vignette "Center Seat" after being away for Starfleet command training. Brian Tubbs (unknown) Lieutenant Navigator and Weapons Officer. Currently also holds position as Chief of Security. Peter Kirk Bobby Quinn Rice (4–8) Ensign Nephew of Capt. James T. Kirk. "Blood and Fire 1 & 2"; "The Child"; "Kitumba"; "Enemy: Starfleet!" Janice Rand Meghan King Johnson "Come What May"; "In Harm's Way;" "Blood and Fire 1 & 2"; "Enemy: Starfleet! "; "The Child"
Nurse Chapel Shannon Quinlan/Giles "In Harm's Way"; "To Serve All My Days"
Captain Kargh John Carrigan "In Harm's Way"; "To Serve All My Days"; "Blood and Fire 1 & 2"; "Kitumba"
Transporter Chief Kyle Jay Storey "Come What May"; "In Harm's Way"; "To Serve All My Days"; "Blood and Fire 1 & 2"; "Enemy: Starfleet! "; "The Child"
Lt. Sentell Jeff Mailhotte "In Harm's Way"; "To Serve All My Days"; "Blood and Fire 1 & 2"; "Enemy: Starfleet! "; "The Child"; "Kitumba"
Xon Patrick Bell "Blood and Fire 1 & 2"; "Enemy: Starfleet! "; "The Child"; "Kitumba"
Lt. Cmdr. Prescott Paul R. Sieber "Kitumba"
Admiral Withrow Robert Withrow "To Go Boldly"; "Mind Sifter"; "The Holiest Thing"; "Torment of Destiny"
Original cast, left to right: Bray, Irons, Quinn, Cawley, Kelley, Root, and Lim. The Star Trek: New Voyages pilot episode was produced by James Cawley, Jack Marshall (series director at the time), Pearl Marshall, Max Rem and Jerry Yuen. Episodes 1 was produced by James Cawley, Jack Marshall, Pearl Marshall, Max Rem, Amanda Stryker, James Lowe, Jeff Quinn, John Muenchrath and Rod Roddenberry (Gene Roddenberry's son). Episode 2 was produced by James Cawley, Jack Marshall, Erik Goodrich, James Lowe, Jeff Quinn, John Muenchrath and Rod Roddenberry. The pilot and the first two episodes were directed by Jack Marshall. However, after filming of "To Serve All My Days" it was announced (December 29, 2005) that Marshall would leave the series. Max Rem continued his participation for another 6 months of post production and then also left the project. July 2013 saw major announcements for production of the series, with James Cawley leaving the role of Captain Kirk to focus solely on production of the show and original series writer David Gerrold taking on the duties of Executive Showrunner in hopes of producing episodes with greater regularity. Gerrold also personally announced that due to an overwhelming backlog, the show would no longer accept script submissions, nor would any episodes based on existing Star Trek books, comics, stories or other published works be adapted to the series – due to a request by CBS legal in the fall of 2011. Rather, all further episodes will come from original works by previous Star Trek writers or crew associated with the series. Several past members of the Star Trek cast and crew have expressed support for the project, and even contributed to it. Walter Koenig Pavel Chekov "To Serve All My Days" Koenig played Chekov in the Original Series and subsequent films. George Takei Hikaru Sulu "World Enough and Time" Takei played Sulu in the Original Series and subsequent films. Mary Linda Rapelye Ambassador Rayna Morgan "To Serve All My Days" Rapelye appeared as "space hippie" and former Chekov love interest Irina Galliulin in TOS episode "The Way to Eden." William Windom Commodore Matt Decker "In Harm's Way" William Windom reprises his role of Commodore Decker from nearly 40 years earlier in TOS episode "The Doomsday Machine." Malachi Throne Korogh (Kargh's father) and Commodore José Méndez (voice) "In Harm's Way" Throne played Commodore José Méndez in TOS episode "The Menagerie" and Romulan Senator Pardek in the TNG episode "Unification." Eddie Paskey Admiral Leslie "Come What May" Eddie Paskey plays the father of Lt. Leslie, an uncredited but frequent character he portrayed in the original series. John Winston Captain Matthew Jefferies "Come What May" John Winston played the transporter chief and relief helmsman Lieutenant Kyle in the original series, and later as Commander Kyle (same character) in Star Trek II: The Wrath of Khan as communications officer on starship Reliant. His character's name here pays homage to the real Matt Jefferies, who co-designed the original starship Enterprise. The first episode, "In Harm's Way," features Eugene "Rod" Roddenberry, Jr., the son of Star Trek creator Gene Roddenberry, as a consulting producer. Sam Witwer ("Crashdown" from Battlestar Galactica, Doomsday in Smallville and Galen Marek from Star Wars: The Force Unleashed) is the voice of the Guardian of Forever (credited as "Simon Judas Raye"). For the second episode, "To Serve All My Days," written by original series writer D.C. Fontana, original cast member Walter Koenig reprises his role as Pavel Chekov. Mary-Linda Rapelye (Irina Galliulin in the original series episode "The Way to Eden") appears as an ambassador. The third episode, "World Enough and Time," was co-authored by Marc Scott Zicree and Michael Reaves. Zicree, who also directed the episode, contributed the stories for the "First Contact" episode of Star Trek: The Next Generation and "Far Beyond the Stars" for Star Trek: Deep Space Nine. Reaves, who co-wrote (with Diane Duane) the "Where No One Has Gone Before" episode of Star Trek: The Next Generation, originally pitched a story to the unproduced Star Trek: Phase II series in which Sulu ages by thirty years, and that story served as the basis for this New Voyages episode. Majel Barrett Roddenberry provided the computer voice in this episode. David Gerrold (author of TOS episode "The Trouble with Tribbles") has signed on to pen two episodes. One, originally entitled "Blood and Fire," was originally pitched for Star Trek: The Next Generation, but was rejected. Gerrold later claimed the story was rejected because it dealt with homosexuality and AIDS. It was later re-worked as the third book in his Star Wolf series of novels. Denise Crosby guest starred as Natasha Yar's grandmother, Dr. Jenna Yar, in David Gerrold's "Blood and Fire." In addition, Bill Blair guest starred as Commander Blodgett, and The Amazing Race host Phil Keoghan made a cameo appearance as Admiral Keoghan. Like all fan-films, New Voyages exists at the whim of the Star Trek franchise owners CBS (and previously Paramount Pictures), which has to date tolerated the distribution of fan-created material as long as no attempt was made to profit from it. This tolerance was tested in early 2012 when New Voyages announced that they would film "He Walked Among Us," an unproduced script that Norman Spinrad had sold to the original series. But when CBS claimed ownership of the material, the plans were cancelled. CBS had not protested over the series' use of "Blood and Fire", which had been written for Star Trek: The Next Generation; "The Child", and "Kitumba", which had been similarly developed in the late 1970s for the aborted series Star Trek: Phase II, or Mind-Sifter published by Bantam Books, because they were filmed before the Star Trek movies directed by JJ Abrams were in production. CBS wants to keep all material it has previously purchased or licensed in any way as possible work to be drawn on for future licensed films. The pilot episode, "Come What May", begins with the late-1960s NBC "In Living Color" sequence. It ends, as did the 1960s episodes, with the animated Desilu Productions logo, with no mention of Paramount. Starting with "Enemy: Starfleet", the series uses the late-60s CBS color opening (reflecting the series' current ownership by CBS Television Studios) and ends with the logo of Cawley Entertainment Company, Cawley's production company. ^ "2008 Hugo Award Results Announced". World Science Fiction Society. Retrieved August 14, 2008. ^ Bennett, Bruce (August 8, 2007). "Star Trek: A New Enterprise". New York Sun. Retrieved July 9, 2011. Since 2003, a crew as altruistically minded, culturally diverse, and indefatigable as the Enterprise's complement has periodically toiled in a former car dealership warehouse in upstate New York.... "Star Trek: New Voyages" is the brainchild of fans James Cawley and Jack Marshall. ^ "Wired 13.12: To Boldly Go Where No Fan Has Gone Before". Wired.com. January 4, 2009. Retrieved August 17, 2011. ^ Post, Paul (October 11, 2015). "A 'Star Trek' Dream, Spread From Upstate New York" – via www.nytimes.com. ^ "Star Trek Phase II Featurette: Prime Timeline Strikes Back + P2 Update From Cawley". TrekMovie.com. Retrieved August 17, 2011. ^ Gerrold, David. "Update". Retrieved July 10, 2013. ^ Shuster, Fred (2006). "FUTURE 'TREK' FROM VALLEY PORTAL, SPACE ODYSSEY TRAVELS ONTO THE WEB". The Free Library. Retrieved October 23, 2009. ^ Vinciguerra, Thomas (March 28, 2012). "A 'Trek' Script Is Grounded in Cyberspace". The New York Times. This page was last edited on 13 March 2019, at 01:30 (UTC).